It’s always a pleasure to explore an unfamiliar part of one’s own country. I’d not heard of Hepburn Springs, Victoria but when my family suggested I fly down and spend the weekend there, I said sure. Hepburn Springs, two hours out of Melbourne and ten minutes from the town of Daylesford, has the country’s largest concentration of mineral springs and more spas and resorts than it has supermarkets. My brother and I stayed at a gorgeous modern holiday home called Breakneck Gorge, a birthday gift to my brother from our sister. We didn’t even bother going to any of the spas around town because the place was so nice. And you haven’t relaxed until you’ve had a bubble bath in a spa with a glass of wine. The best part was the wildlife. Contrary to popular belief, not every Australian sees kangaroos regularly as most of us live in cities. 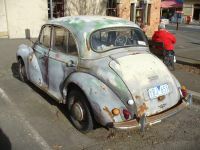 I saw my first one in the wild earlier this year and, unfortunately, it was a dead one on the highway to Toowoomba. To my absolute delight, Breakneck Gorge is full of kangaroos and they hang out near the house in the early hours of the morning. I know Americans have a particular fascination with koalas but, while they’re cute, they’re grouchy and they’re frequently infected with chlamydia. 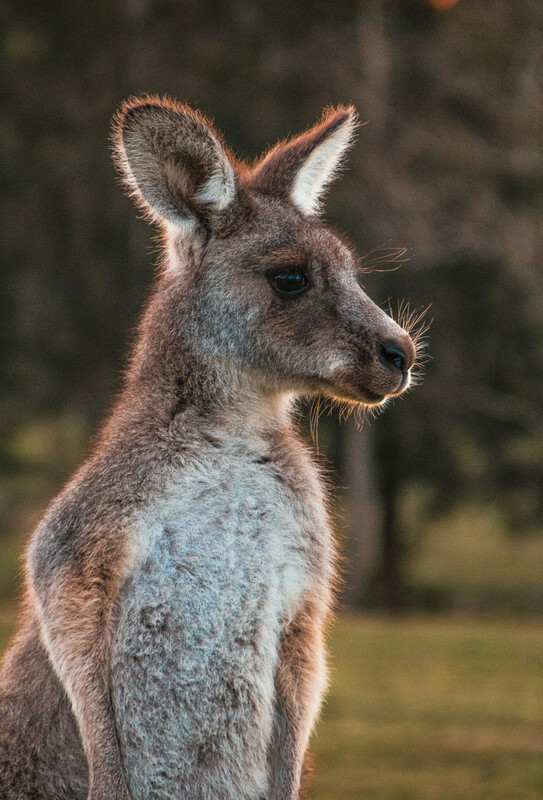 Kangaroos, on the other hand – along with the related wallabies, pademelons and other bounding marsupials – are gorgeous animals and like nothing else on this planet. To see them hopping so close to me filled me with a child-like joy. 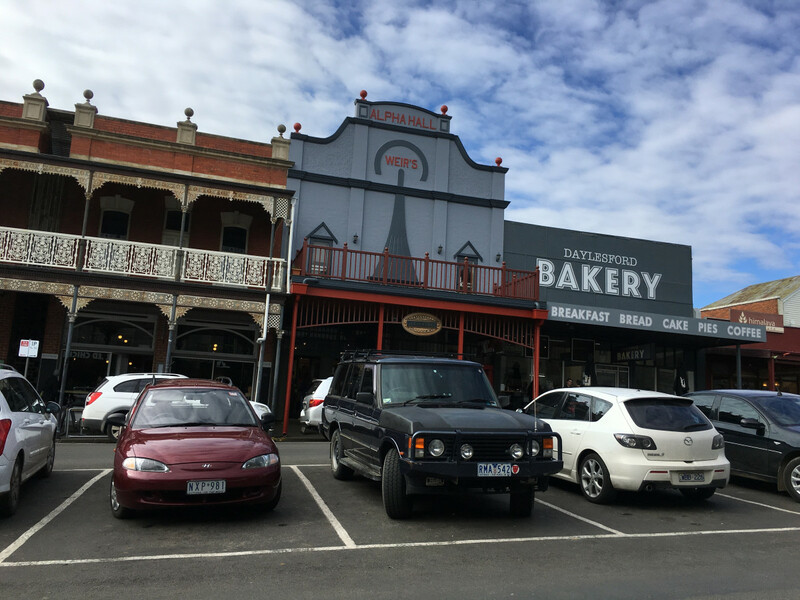 There’s only a few non-spa businesses in Hepburn Springs so to get something to eat, we ventured to Daylesford. 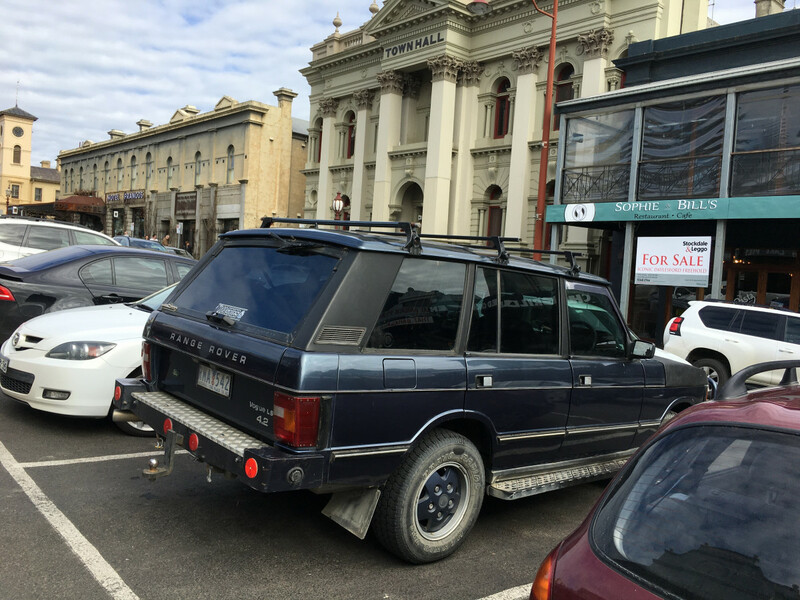 It has a charming town center where I saw this Range Rover Vogue. The badge says this is a Vogue LSE 4.2 V8, using the stroked version of the Rover (nèe Buick) 3.5 V8 that was introduced in 1992. There’s one small catch: the 4.2 was never sold here – our Vogue LSEs kept the regular 3.5 – so either the badge has been added or this is a personal import. 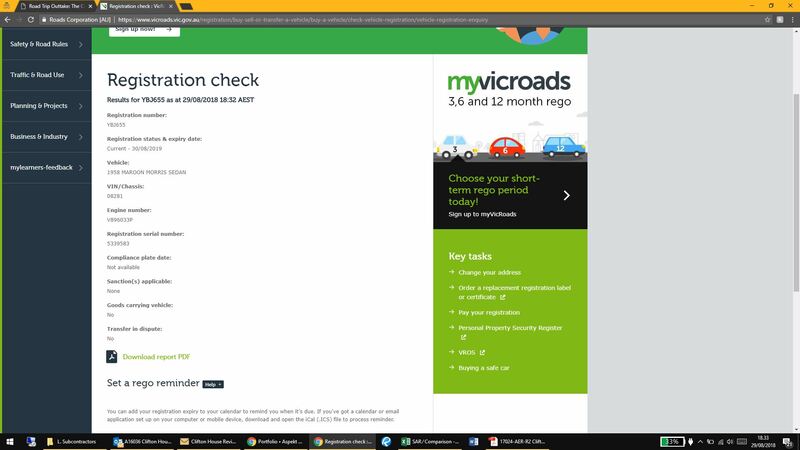 Land Rover Australia’s rationale for not offering the 4.2 was that rural drivers had less access to premium unleaded fuel which the 4.2 required. Remember, this was a time when a luxury, full-size SUV was a novelty. Even back then, though, I wonder how many of these Vogues actually went off the beaten track. 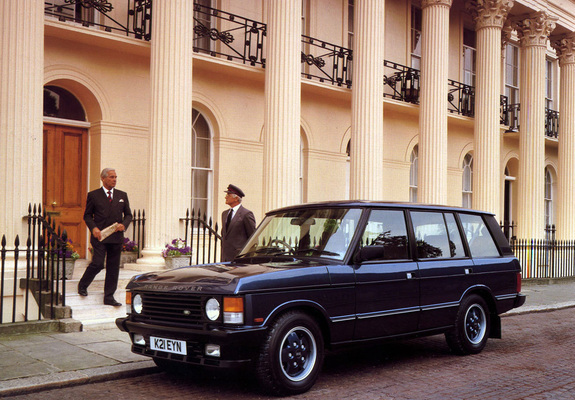 Vogue LSEs – badged County LWB in North America – had a 108-inch wheelbase, 8 inches longer than the regular Range Rover. They also saw the introduction of electronic air suspension. Coming right at the end of the first-generation Range Rover’s long lifecycle, these Vogue LSEs were the poshest, most upmarket Range Rovers yet, the options list including Italian Poplar veneer picnic tables for the rear passengers. The color-keyed wheels are a nice touch. In a town with a public school that looks as fancy as this, I’d say this rig looks right at home in Daylesford. So much to like about this. 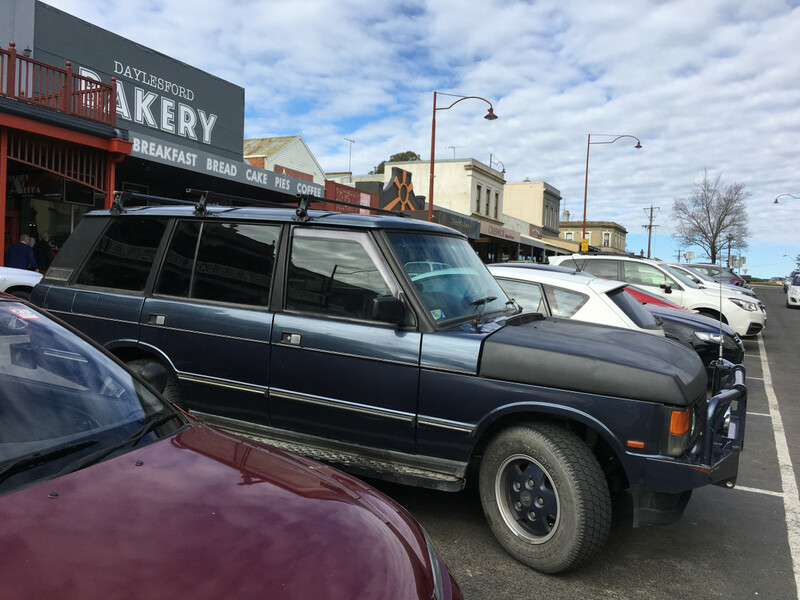 The town, the Range Rover, and the startling (yes I’m a naive foreigner) revelation you hadn’t seen a kangaroo in the wild. I lived in Perth for less than a year and must have seen a hundred – probably 97 were roadkill, but I never considered how thin on the ground they might be elsewhere. Some suburban golf course shot scores of them when I lived there, they left blood all over the fairways. No word on whether Bill Murray was involved. Finally, I am in love with koalas. But not quite so much as to be worried about chlamydia. I had no idea you didn’t practically have Kanagaroos as pets the way some people here have horses. 🙂 My wife and daughter went to Australia when she was seven and they went to some kind of preserve that was overrun with Kangaroos. My daughter got too close to one named “Beanie” and got punched in the chest, knocking her down. I didn’t know that they can actually be quite dangerous which of course makes perfect sense. Since then she hasn’t been as enamored with them, her favorite animal from the trip is the wombat. That’s a nice Vogue, I didn’t realize it was equivalent to our County over here. I can’t even imagine worrying about the air suspension on a Range Rover though! This is the first I’ve heard of a Range Rover County. County was the civilized version of the older Land Rover 90/110/Defender in the UK. Come to think of it, it doesn’t seem like a great choice for the Range Rover. I can understand why they didn’t want to use the name of a fashion magazine, but county is such a ubiquitous, mundane word in US. Roos seemed fairly common to me but I spent a lot of time in rural OZ, we used to have Devils and Quolls feeding on out lawn at night in Cygnet, This stuff isnt prevalent in the larger towns though, Nice old Range rover dont see many of them around now everyone seems to have replaced them with other Remuera tractors here. The thing that struck me was how similar the architecture looks to what you might see in an historical part of a city in the eastern US. The buildings in that first picture (except maybe the bakery) would fit right in in Old Sacramento, or pretty much any Gold Rush era California town. 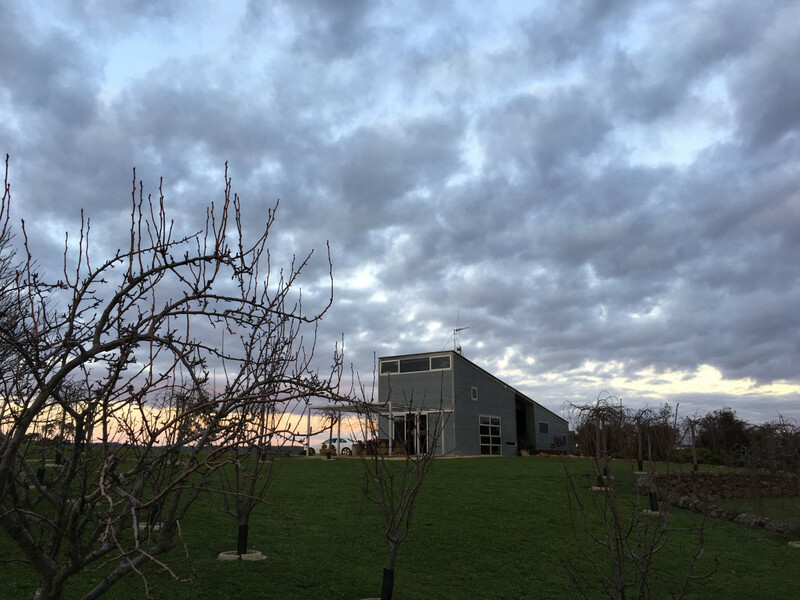 No coincidence – Daylesford was established in the early 1850’s after gold was found in the area. 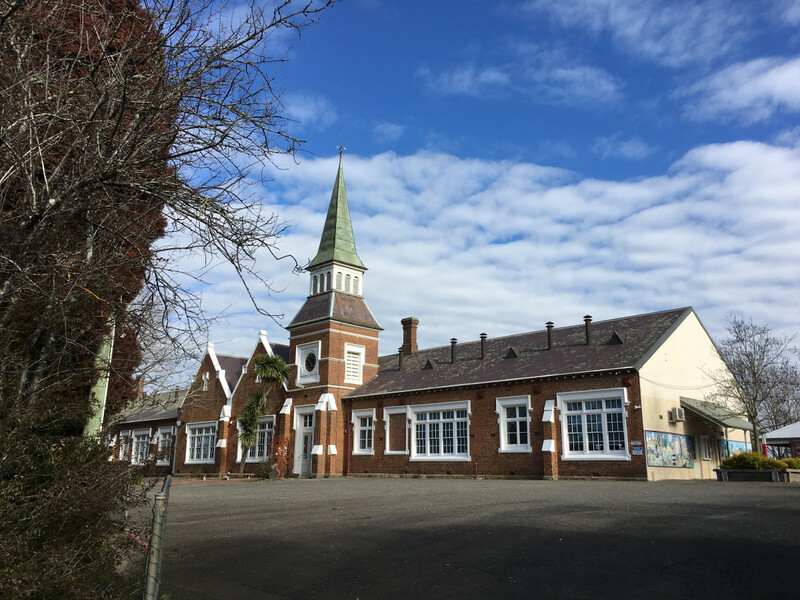 That primary school was opened in 1875 and looks like a larger version of to the one I went to (opened in 1858). It must have been a standard design for the day. Eastern US? I totally meant to say “western US”, if it wasn’t obvious from the mentions of California in the second sentence. God I’m a terrible proofreader. The mind sees what it expects to in some cases – it didn’t register with me either! 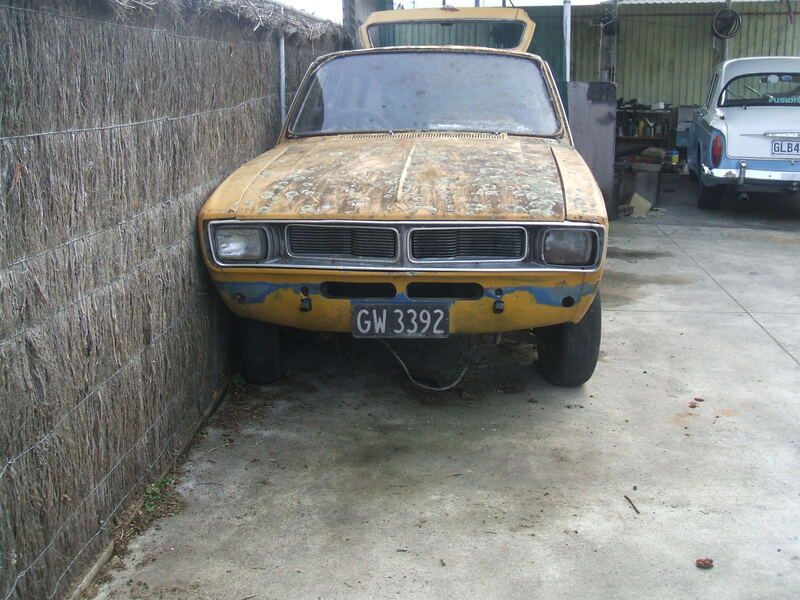 Did you see any Hillman Hunters over there?I remember reading somewhere they used to make them in Australia. I haven’t seen a Hunter on the road here for many years. IIRC they only made them until around 1973 then Chrysler started assembling Mitsubishi Galants instead. Yes Chrysler shut the ex-Rootes factory in Port Melbourne at the end of 1972 after they had built approx 54,000 Hunters in Australia. Not many left in daily use, my mate had a wagon for years until it was written off for him. Like Pete, I very rarely see them. This one used to be around, but gone from the curb now. Note the ‘Safari’ badge at rear – a legacy from Chrysler Australia’s naming bin. Think that badge has a Valiant part number too. 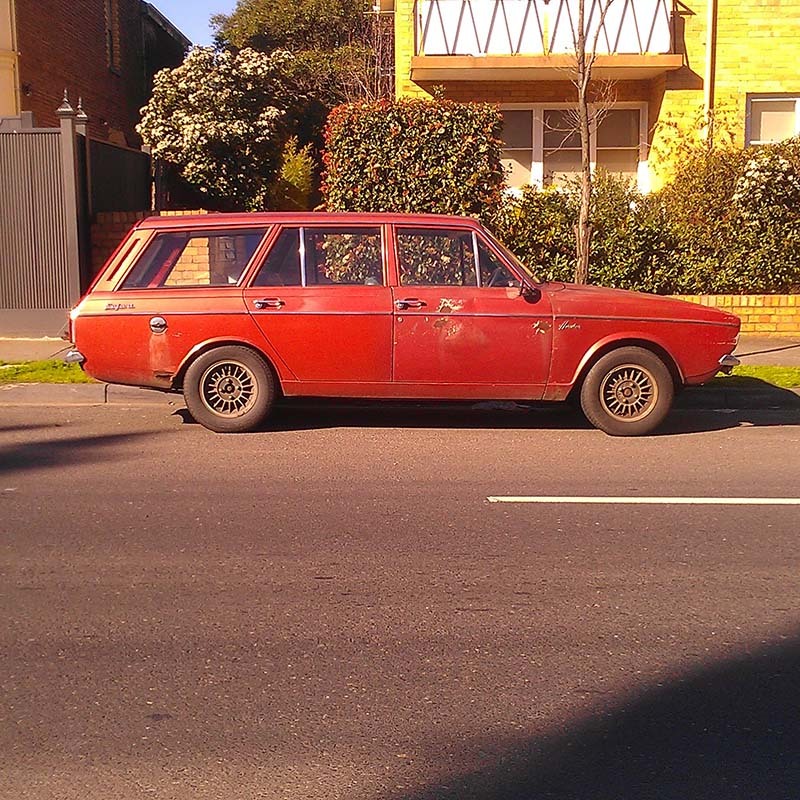 Saw quite a few Hunters in OZ mind you I left 15 years ago but a friend in Cygnet Tasmania had three 1 Safari wagon, 1 Royal sedan and 1 Minx sedan which was her daily drive for many years, Still a fairly often seen car in New Zealand though production here stopped in 79. You didn’t see MinorPatina parked by the antique shop on the corner? It used to be something of a landmark in this town. Mind you, It’s five years since I took this shot so anything might have happened to it. 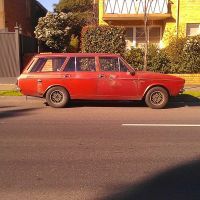 The rego for the ‘maroon’ Morris expires in a year and a day, so we might be in luck! And congrats on seeing your first living kangaroo in the wild! I can’t imagine it’s an all that common sight for many Australians, much like an American seeing a moose or bald eagle. Regarding koalas, I’ve heard similar from friends of mine who have either been to or have relatives living in Australia. Does Australia have Sloane Rangers? In the UK, Range Rovers were supposed to be their standard vehicle, while the Queen gets by with a Discovery. Probably a bit pricey for that here. Never mind the Range Rover, what about that mid ’90s Elantra wagon parked next to it! I haven’t seen one that nice since around the turn of the millennium, or at all since around 2010. Truly lovely place, Daylesford, been going up there ever since I was a kid. It was a flash Victorian-era spa town, and built lavishly with goldrush money. It had hotels, botanic gardens, a lake and guest houses aplenty. It had it’s own (superb and winding) branch line for Melbourne holiday makers, and as it happens, as a kid I was on the last train run from Melbourne into there in about 1976, a steam train. A close look at the back the much-used Rangie shows, on the left, a household door lock to hold that infernal, popping back window shut! A farm owner’s paddock basher*, my guess (bit heavy on the juice for a hippy). Love it. Looking forward to more, William. Great summary of the town, not that I know it that well having been there only a handful of times. The Range Rover also has a LPG conversion, the filler is on the right-hand end of the aftermarket bumper, and two red decals on the number plate indicate 2 tanks. Very common due to their appetite for fuel. I spent a lot of my childhood and teenage years in Daylesford. The parents had a holiday house up the top of Wombat Hill back in the ’80s, and once that was sold I learned to drive on trips up there about once a month, where we’d go and fill a large collection of empty bottles with mineral water at Leitch’s Creek. BTW the spring there has the best-tasting mineral water of the surrounding area. 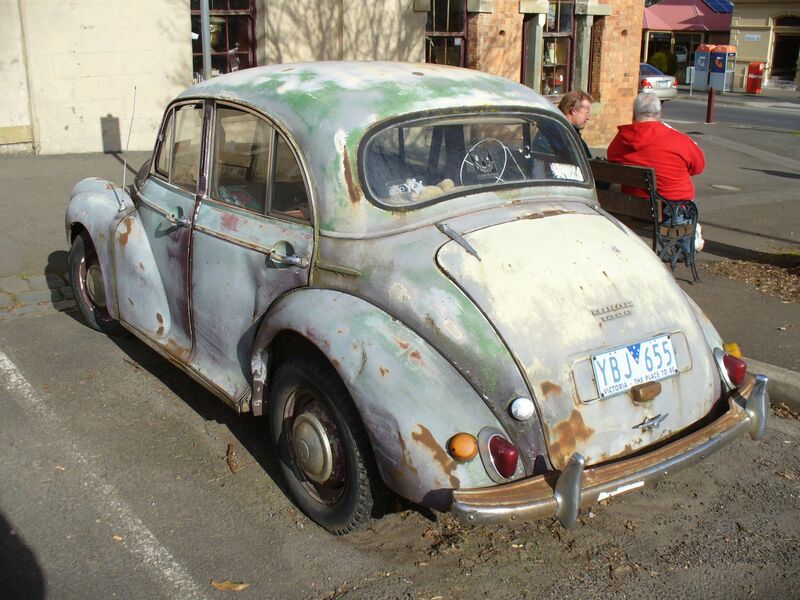 I remember the Morris – it used to be burgundy! I haven’t seen it on my last few trips. Dad had the first Porsche of the area – a mid ’80s 928S which ate alternators. Back before the town became gentrified with tourist shops and cafes. Such a different place these days.